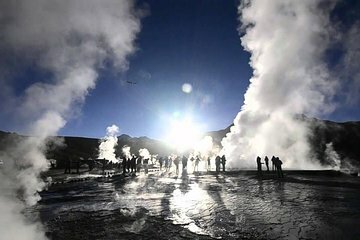 This early morning tour is the easiest way to visit Chile’s Geiser del Tatio from San Pedro de Atacama, without having to worry about planning transport. At 14,170 feet (4,320 meters) above sea level, this geothermal field is the highest in the world. You’ll ride in a comfortable van and take in spectacular views of the bubbling geysers at one of the best times of day—sunrise. Plus, breakfast and national park fees are included. Departure time: 5:00/5:30. Arrival time: 12:30. Available every day. Always take water with you, wear sunscreen and sun proteccion. We recommend clothes for very low temperatures ( -5 to -20). Do nort forget to be prepared for the weather!